The club was founded at a meeting in the “Rose and Crown” public house in North Parade, Oxford on 27th September 1992. Its stated aim was “to promote the use and enjoyment of hand-powered boats on the Isis and elsewhere”. The club adopted the rose and the crown as its emblems. 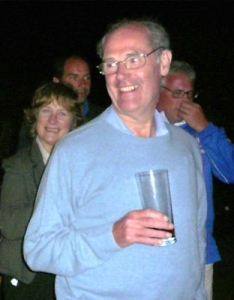 Richard Norton was the main founder of the club and arranged most of the early outings, writing news of these and other interesting topics several times a year via a newsletter called “Waves and Reflections”. Early members who were at that meeting were Roger Blackburn and Robert Mattock. The club was named “City Barge” because its first members intended to promote the reintroduction of livery barges on the river Thames on London. The various City of London Guilds used to own livery barges which were used extensively on the tidal Thames in the past. City Barge’s love affair with Venetian rowing began in about 1993. Members rowed sitting down in the 32 kilometer rally called the “Vogalonga”, around the Venetian lagoon. They became interested in rowing the event in Venetian style, standing up. A ceremony took place at the clubhouse of the Società Canottieri Francesco Querini in Venice at which the Querini and City Barge were twinned. In September 1994 Querini gave City Barge a beautiful and practical boat, a Venetian sandolo, their equivalent to a Thames skiff, which was named the Ashley Clarke. Lady Clarke became our honorary vice president. The following year City Barge returned the compliment by giving the Querini a Janousek sculling boat. 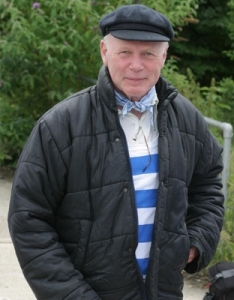 The club realised a closer involvement in barge rowing when several members who belonged to the Draper’s Company in London influenced them to buy a six oared shallop in 2003. This, the “Royal Thamesis”, is modelled on the ceremonial boat of Queen Mary of 1689. 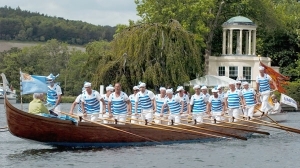 A similar replica visited Henley Royal Regatta in 1912. The Drapers based the boat in Oxford and asked City Barge to operate it for them. Read more about the shallop, ”Royal Thamesis”. This north Oxford local pub continues to be a place where we return for social occasions. The landlord and landlady, Debbie and Andrew Hall, have thrived there during the whole of the life of the club. 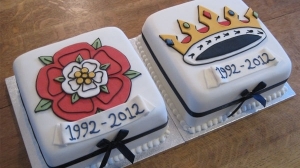 We returned in 2012 for a twentieth anniversary lunch and enjoyed chicken casserole and two cakes with the club logos of a rose and a crown. Many past events attended by the club, and enjoyed by the members, are recorded chronologically in our news pages. These are various in nature and location and it is a source of satisfaction that the club has been able to be part of many special occasions. The club now has ninety five members and ten honorary members. We go rowing almost every Saturday morning and have an extra event every month. In June 2015 seven boats of members and the club took part in the Magna Carta procession on the occasion of the 800th anniversary of the signing at Runnymede. The downstream row from Lechlade to Benson is a well attended event as ever. Ten new members have joined the club in the period 2014-2015. The club can be said to be healthy.